As a senior citizen living in my home country of Japan, after having retired from 30 years’ work with the United Nations Public Administration Division, I was privileged to serve as a quarterly columnist of PATIMES for the last few years. In this column, I reported on Japan’s several public governance practices. I examined the practices of the central and local government of Japan, in light of my old nest good public governance principles, i.e., “effective, efficient, transparent, accountable, innovative and citizen-centered public governance, administration and services.” I chose for my column articles, practices related to UN Sustainable Development Goals (SDGs- post Millennium Development Goals) for which my old nest has been serving. (See the home page of UN Committee of Public Administration (CEPA) that guides the work of the currently renamed UN Division of Public Administration and Development Management.) My articles included cases on: Japan’s women empowerment, the Fukushima nuclear disaster emergency management, social media influence in public service, local citizens’ preparedness to nuclear emergency, citizens roles in municipal garbage disposal system, Japan`s health care public insurance systems vs. Obama care, Medical and nursing care systems for elderly, the birth of Japan’s first female Tokyo Governor, Japan’s records management and transparency disclosed in Prime Minister’s scandals, etc. My articles avoided the so-called “best practice” approach, and emphasized more on the deficiencies in the Japanese practices in light of the UN good public governance principles. 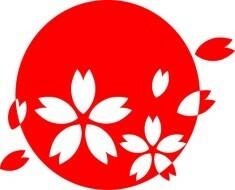 I love my own country, always wishing that Japan’s practices of public governance, administration and services be the best in the world. I may therefore have been a severest critic on my own country. 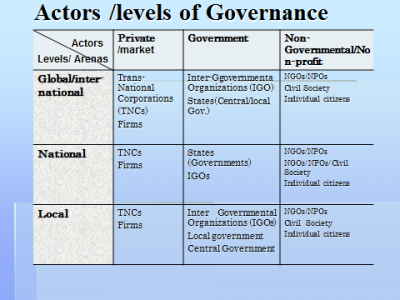 In governance, various actors (described in diagram I) exist as stakeholders in each level of community, national, local and global (see diagram II). 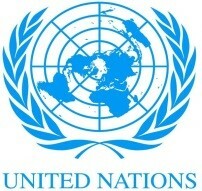 Global or international governance is beyond my knowledge. However, principles of “good” public governance that my old UN nest has fostered can be applied in all levels of governance. 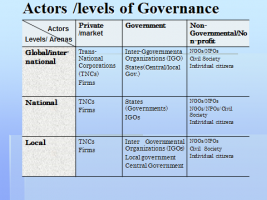 In governance, it is the government, local or national, and in the global level, inter-governmental organization (such as UN, EU, AU, ASEAN, WHO, etc.,) that takes the primary responsibility to govern the entrusted policies and issues, effectively, efficiently, in transparency, by accountable and innovative administration and services, and soliciting cooperation of all the actors in the community. 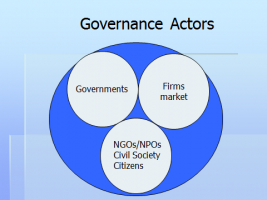 In the governance approach, stakeholders are desired to cooperate for the given goals, such as set for example in the UN Sustainable Development Goals (17 goals, including poverty reduction, attaining food security, healthy life for all ages, inclusive and equitable quality education, women empowerment, securing clean water, clean renewable energy, productive employment, innovations, sustainable cities, prevention of global warming, revitalizing global cooperation for reaching SDGs, etc. See UN home page on SDG). While soliciting cooperation of all actors is desired, in reality, government decision may be opposed strongly by other actors in the community. For example, the U.S. government declared withdrawl from the Paris Climate Accord that had been agreed by the member countries. In the United Sates, quite a few state governments, corporate leaders and citizens acted contrary to the government decision. At global level, French President and German Chancellor emphatically called for all Accord member countries to continue to implement the global warming prevention framework beyond 2020. It appears now the world is entering into difficult age. In many countries, communities are divided into two extremes, and even democratically elected government leaders are unable or have difficulty clearly showing where we are landing. In the public governance, head of the government, local or national, must first clarify a future goal design to solicit all actors to participate and cooperate in attaining the goal. Fostering Good public governance, administration and services then can better and must follow toward the goal. During this difficult time, we may be usefully reminded that the United Nations, when created in 1945 out of the world chaos, its Charter preamble singled out tolerance as the guiding principle to overcome the differences and to create the culture of inclusion to attain the UN ideals. SDGs are the recent renewal of the UN ideals in the economic and social fields. Toleration is easy to say, but most difficult for any individual or organization, and yet may be the only way to make impossible possible. ASPA and its professionals have been the leading promotors of good public governance and administration in the world, and have always advised the UN Public Administration Division since its inception, and serving the CEPA which has guided the Division’s work. 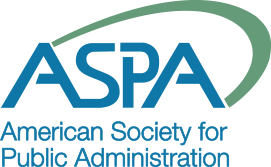 ASPA has been inclusive of non-Americans, and cooperating with many public administration institutions in the world. As a long time witness, I wish to extend salute and all the best to ASPA. Finally, many thanks to the readers of PATIMES for tolerating my intolerable articles.